Aside from gadgets and games and many other things, liberal DIGGERS love to DIGG articles that demean George Bush or the United States or makes fun of right wing Christians or twaddles about government conspiracies or disputes that there is an Islamic Threat. For now, I would like only to discuss this last item. British officials are concerned over some sensationalized reporting by the media on the recent car bomb attacks in London and Glasgow. Add this plot to the growing pile of half-baked terror plots carried out by patsies, dim-wits, and extremist individuals who are no way connected to Al Queda. Now the original article only says we should not jump to conclusions about any links to Al Qaeda. But look at how this DIGGER spun it into "there is no Islamic threat - it's just a big media scare - no real danger here." Get a grip guys, these "attacks" are the work of nut cases and not some grand, centrally coordinated master-plan to bring about the downfall of civilisation. I mean the only common factor amongst these groups is religious extremism, branding all these guys under the same heading is like saying a crackpot letter bomber who happens to be white and Christian is the beginning of a fundamentalist Christian uprising against secularism, simply put it is socially acceptable racism! I suspect the doctors involved in the latest attacks were protesting the Iraq war more than anything else so yes yet again we as society probably brought this on ourselves. The men allegedly behind last week's failed terror plots in England and Scotland have connections to al Qaeda in Iraq, U.S. officials said Tuesday. At least some of the suspects were recruited by al Qaeda while they were living in the Middle East, the sources said. Countering the frothing rabid hysteria that is being whipped up by a fervent media in response to three failed car "bomb" attacks in the last few days in the UK, ex-CIA agent Larry Johnson joined Keith Olbermann to underscore the truth behind the madness - that the so-called bombs were primitive at best and would not have killed anybody. Yeah, right, this is the real stuff that proves there is no Islamic threat! Liberals love it when terror plots fail. How can there be an Islamic threat when they don't succeed at killing anyone? But can this ex-C.I.A. be correct? Was the car bomb relatively harmless? 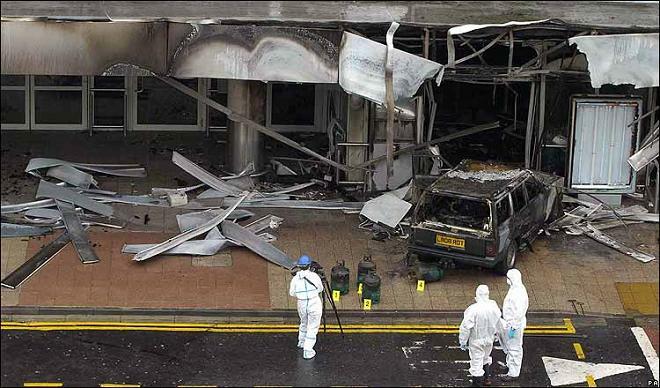 Well, CNN commissioned the Energetic Materials Research and Testing Center at New Mexico Tech to build a car bomb using the same materials investigators say the UK terrorists used in their failed attacks on London and the Glasgow airport and detonate it to see what would happen. Not only did the Jeep Cherokee used in this test get blown to bits but there were metal fragments scattered up to 450 feet away and a nearby building was incinerated. John Smeaton's New Clan Badge! No one would have been hurt if the London cars had gone off? What utter nonsense. Being a liberal must make you stupid and blind. So take the liberal test: look at the photo at the top of the article. 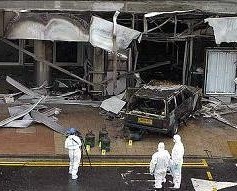 Officials report that the car that exploded was driven by the same people who were responsible for the London cars that did not go off. Now remember, the ex-CIA idiot said it was unlikely anyone would have been harmed. Take a look at the photo. Do you think you can squint and make yourself stupid enough to think no one would have gotten hurt if those propane canisters had exploded with nails wrapped around them? Seems to be a lot of damage for a dud, eh?